What a treasure! A child of books is absolutley stunning. I’ve had this for a few weeks now and just keep picking it up again and again. I don’t want to put it down. I’m in awe of this beautiful and wonderful thought-provoking book. A little girl sails her raft ‘across a sea of words’ to arrive at the house of a small boy. She takes him away on the most wonderful adventures and I am suddenly going along with them. Pictures and words all about stories and how we come from stories. Who we are today is because of stories. The typography throughout use lines from classic stories such as Alice in Wonderlandand is brilliantly done with so much thought and consideration. One of the special messages is that sometimes in life we get so caught up in the serious things that we forget to look around. We forget what we have and what, with a little imagination, we can do or can become. Love, love, love it. Be sure to check under the cover too for a lovely surprise. Every page, every word is perfect. The end pages too are gorgeous with lines of book titles. This is the one book you really need to get your hands on. I was very fortunate to receive an ARC of this book from the Random House Road Show and being a fan of John Boyne’s work I devoured this. I recall when John Boyne was here in Christchurch some years ago to promote his book The boy in striped pyjamas that when I lined up to get my copy signed, I told him how cross I was at such a tragic ending. We discussed it briefly (the line was long) and I know there could not have been any other ending. The point of war is tragic. Boyne makes a similar point in his latest novel but on a different level. Here, five year old Alfie knows there is a war. His father, after all has signed up willingly to fight and is on a secret mission hence the lack of contact. Letters arrived from his father in the trenches when war first started but then they stopped. War was supposed to be over by Christmas but no-one ever said “which Christmas”. Four years on and war is still going but still no letters. A sequence of coincidences prove too much for Alfie and he begins his own journey to find out about his father. This is a moving, poignant tale of war and its impact on family life. Boyne weaves in different points of view from the people living in Damley Road where Alfie Summerfield lives. This book moves along subtley and then hits you with a punch that leaves you thinking about Alfie and his family, long after you have finished reading. 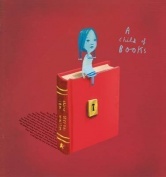 Oliver Jeffers has done a brilliant job on the cover of this book. So real in a retro way. Love it! Wilfred has a pet moose but like any pet – it doesn’t always follow the rules. Just how much trouble can he cause? Jeffers work is always brilliant and I simply can not resist anything he does. I can’t wait to see this book.